"A fun way to make your own cherry-infused liquor dessert drink. Tart cherries are the real 'star' of this recipe. Warning: The cherries are very strong after a few months, so eat responsibly. Serve over ice with Sierra Mist® or Sprite® to cut liquor strength." 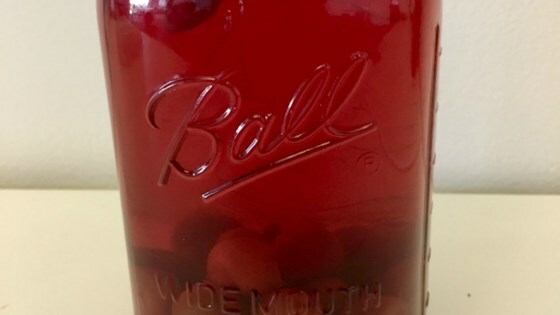 Put cherries in a clean, 1-quart glass jar; add sugar. Fill the rest of the jar with vodka. Place lid on jar and shake. Store jar in a cool, dark area for 1 to 4 months, shaking jar occasionally. Cherries will float in beginning and will settle in time. Use any liquor (rum, brandy, etc.) in place of the vodka, if desired. This is usually made in August and traditionally served with Thanksgiving or Christmas dinner. Liquor-soaked cherries are also very good over vanilla ice cream for a fun adult dessert. Great! I let this sit four months. Next time I would add more sugar. and maybe some spices.